What is this blog about? Why do I need yet another website that describes my professional career when I already have an ePortfolio? The audience for this site is different. More and more, I’ve noticed that the audience that matters the most to me in my job – my students – are not fully aware of the duties of a faculty member, and how there is much more to my job than teaching. Hands-down, my passion lies with providing the most effective and innovative approaches to introductory-level Earth science instruction in my classroom. But there are times I “disappear” during the semester, and I’m challenged with trying to explain to students that going to a conference is actually WORK, not a vacation! So, to my students (and anyone else interested…. ), here is my electronic forum to share with you that not only am I a teacher, but I am a scientist, a researcher, a mentor, an innovator, a conference presenter, a workshop leader, a communicator, and much more. I hope this site allows you to learn more about me and my work. Please feel free to leave comments and ask questions – I welcome the opportunity to share more with you! 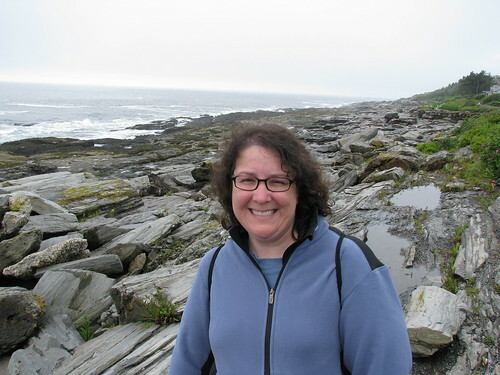 That’s me, at Cape Elizabeth in Maine, Summer 2010.